The QL-A51 from JVC differs from the more expensive QL-F61 in only two ways, it lacks repeat function and full automation. Otherwise it's the spitting image of the QL-F61, including the precision motor, straight tonearm and up-front controls. From the tip of its highly sensitive tonearm to its cabinet base, its one of our most attractive models - and musical reproduction will be just as attractive; resonance and mistracking have become problems of the past. The servo motor is of our own coreless design, to avoid cogging, the annoying rotational fluttering which can spoil music reproduction. Long term accuracy and reliability are assured throughout this sophisticated direct-drive turntable. The tonearm is straight for a reason; it better handles warps and ensures clean low frequency response which is even more important now that digital and direct-cut records are available. Every care has been taken with the QL-A51 to prevent unnecessary record handling - from the manual cue control to the automatic arm lift, return and power shut-off at the end of play. 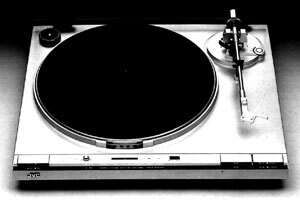 JVC QL-A51 / QLA51 owners manual, service manuals and schematics are for reference only and the Vinyl Engine bears no responsibility for errors or other inaccuracies. The PDF files are provided under strict licence. Reproduction without prior permission or for financial gain is strictly prohibited. This website is not affiliated with or sponsored by JVC.